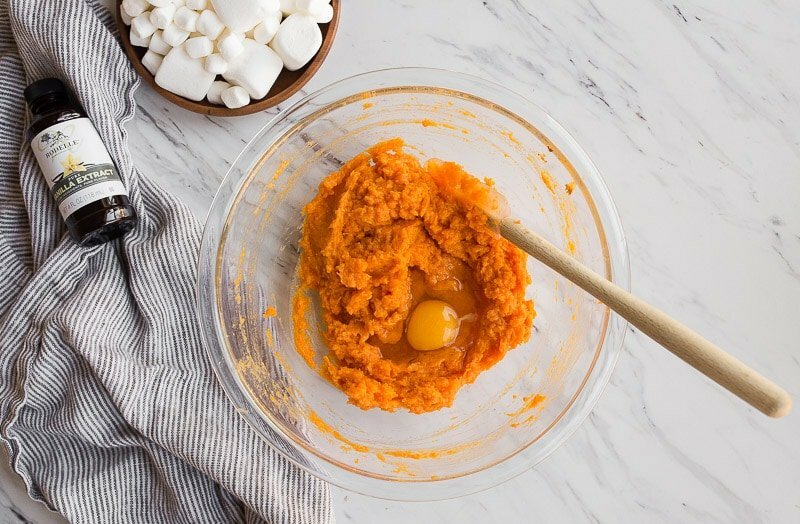 Sweet potato casserole with marshmallows, small batch style. 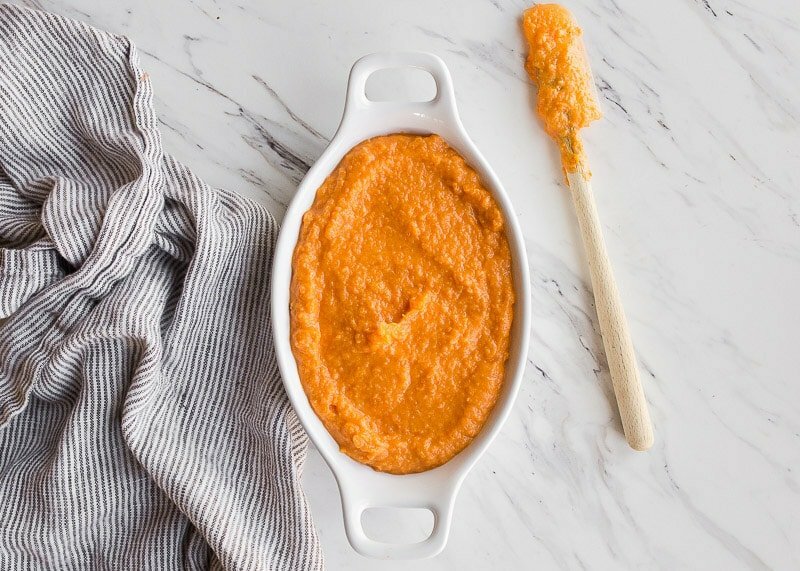 A mini baking dish full of the most perfect sweet potato casserole for two. 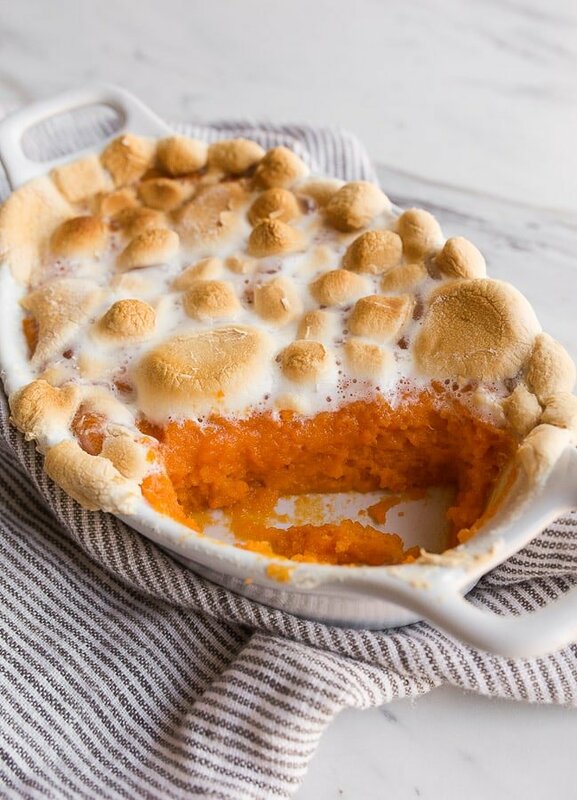 If you think sweet potato casserole is just mashed sweet potatoes topped with marshmallows, lean in, because I need to teach you the way. Real sweet potato casserole is fluffy and light, like soufflé. 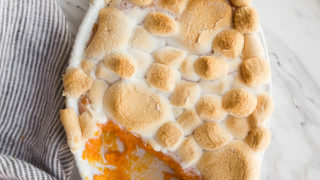 Sweet potato casserole contains mashed sweet potatoes, but it also contains other ingredients that make it puff up and so fluffy. One whole egg in this casserole makes the sweet potatoes light and fluffy, almost like a soufflé. The milk and butter make it super creamy, and the addition of vanilla makes it border on dessert. It’s not your fault if you’ve been served bad sweet potato casserole in your life, and it’s also not your fault if you’ve been the one serving it. The only good sweet potato casserole recipe in the world comes from Southern Living. All other recipes can exit stage left. Burn your recipe cards; memorize this recipe. I know it sounds extreme (and it also sounds like I’m talking about my Southern Cornbread Dressing recipe), but sweet potato casserole with marshmallows and Southern Cornbread Dressing are two recipes that are sacred to me, and I will not tolerate renditions or bad versions. The Southern Living version of this recipe has a crunchy streusel that contains cornflakes and pecans. However, we have allergies in the family, so we’re nut-free for all major family dinners. Basically, all I did was scale down the filling and adapt it for this small baking dish for two. While the original recipe calls for 2 whole eggs for over 4 pounds of potatoes, I used one whole egg for 1 pound of potatoes. The egg is what makes the filling super fluffy! Also, I promise it cooks completely in the oven. You’ll notice my sweet potato casserole doesn’t contain cinnamon or any other spices, except vanilla. In my experience, those spices compete with the marshmallow flavors. 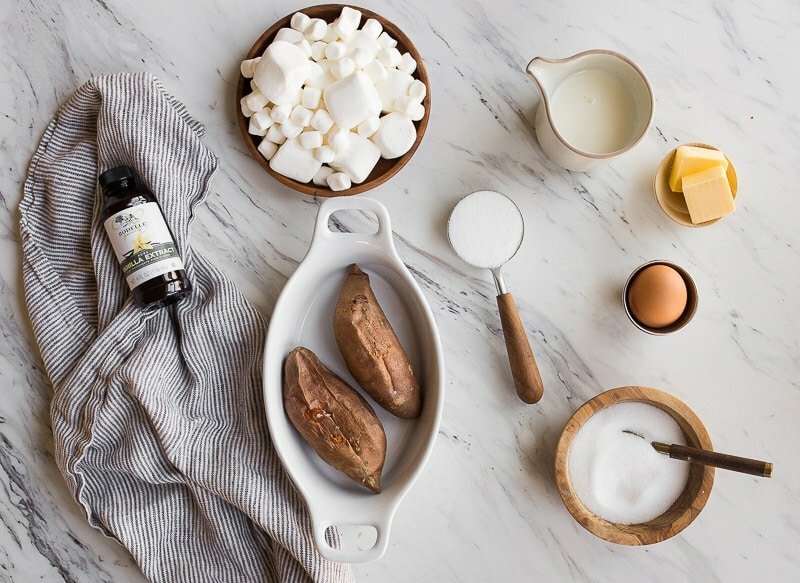 Vanilla heightens the flavors of the marshmallows, and the two work together to create a sweet potato cloud. It’s HEAVEN. If you feel you must, you can add cinnamon. I made this small batch sweet potato casserole in a mini baking dish (the same one that I used for my Southern Chocolate Cobbler). I use an oval 0.6L oven-safe baking dish (this ceramic baking dish is the most similar to the one in the photo). If you’re looking for a round baking dish, try this round 20-ounce baking dish. It perfectly serves two if you’re doing the Thanksgiving for Two thing. This recipe also belongs in my roundup of Thanksgiving Recipes: Sides! 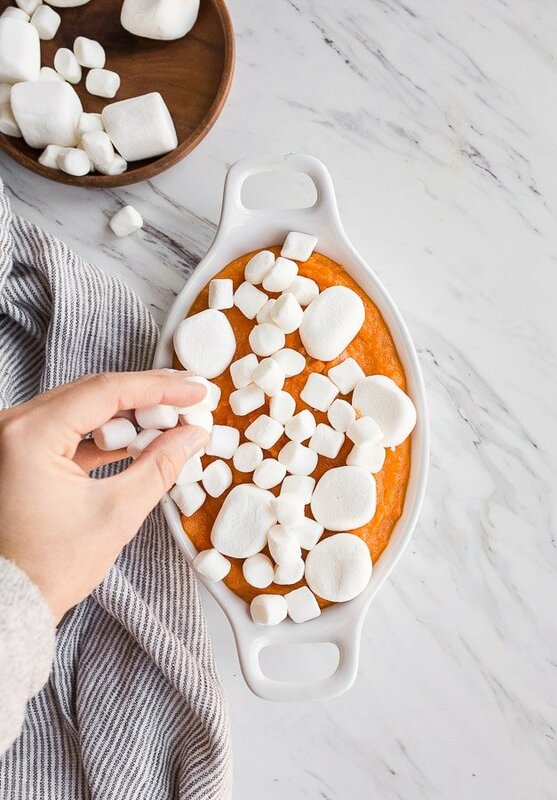 I use a blend of marshmallows sizes to top my sweet potato casserole because my pantry usually has open bags of both. We have a fire pit and a kid that is obsessed with s’mores. I don’t even think she eats the graham cracker and chocolate most of the time, just the marshmallow. So, we always have bags of multiple sizes of marshmallows open. Yes, you can double this recipe and bake it in an 8×8″ pan, or double it again and make it in a 9×13″ pan for a bigger Thanksgiving celebration. But at that point, you should probably just look up the Southern Living version that already has it scaled up, ok? Happy Thanksgiving, everyone! I hope your turkey is moist, your sweet potatoes are fluffy, your dressing is perfect, your gravy is smooth, and your cranberry sauce is tangy! 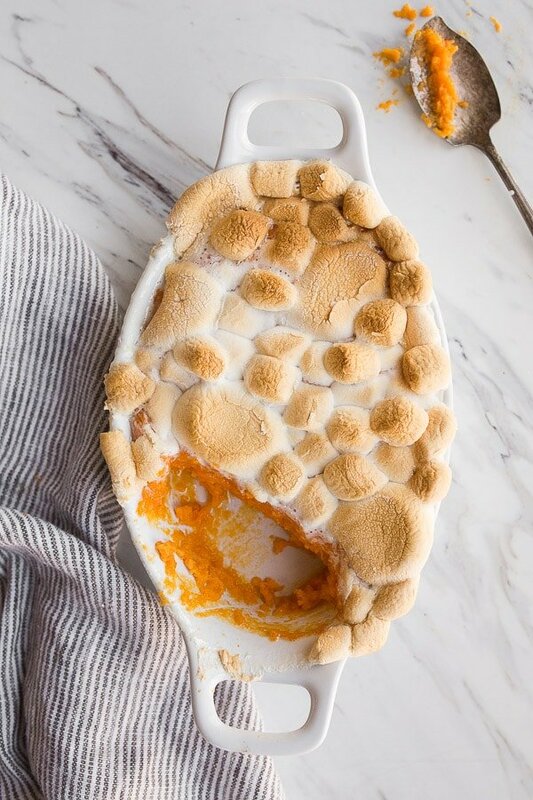 Sweet potato casserole with marshmallows for two. Line a sheet pan with foil, and place the sweet potatoes on it. Prick them with a fork, and then bake for 40-50 minutes, depending on their size. Test with a fork to ensure they're done--their skins will start to collapse when they're soft. Remove the sweet potatoes from the oven. Lower the oven temp to 350, and let the sweet potatoes cool for at least 20 minutes. Meanwhile, in a bowl, whisk together the sugar, butter, milk, egg, vanilla, and salt. Peel the sweet potatoes and add them to the bowl. Stir and mash everything together to combine. Spread the mixture into a small 20-ounce (0.6L) baking dish, and bake for 20 minutes. Remove the baking dish, scatter the marshmallows on top, and bake for another 5-10 minutes, until the marshmallows toast and become lightly golden brown. Serve immediately. Do you use organic marshmallows? If so, what brand and from which store? If I were to double this recipe and cook it in a metal/foil (throw away dish), do you think it would need to cooked in the oven longer? Great question! When I double it, I bake it for 30-40 minutes. Since it has an egg in it, you can always temperature test it to make sure it’s done.